New construction combined with unique architectural renovation make this the ideal vacation house as each of the four bedrooms has a private adjoining bath. Our family beach house is located directly on the Gulf of Mexico where, if you're lucky, the dolphins perform at sunrise. With four bedrooms and four baths, comfortable and sophisticated decor, this house delivers. Upscale bed linens are furnished. 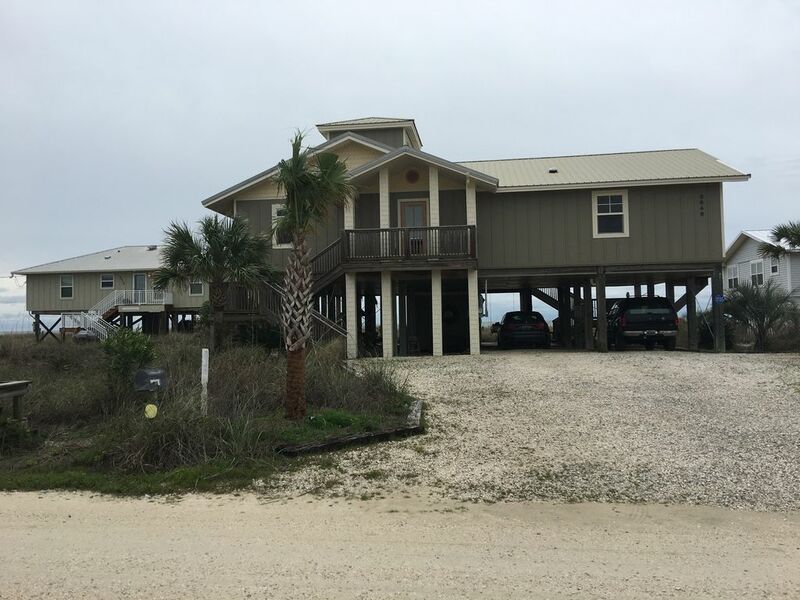 There are two gulf front master suites and the other two bedrooms also have ocean views. First master gulf front: Tongue & groove vaulted and beamed ceiling, jacuzzi garden tub with ocean window, vaulted tiled shower, queen bed, built-in closets, entertainment center with TV & DVD, direct access to sundeck with pergola - computer access and station. Unbelievable ocean views from bedroom and bath. Couples will fight for this one!!! Second master gulf front: Queen bed with private bath with tub and shower, built-in closets, entertainment center with TV & DVD, soothing ocean views, granite vanity. Third bedroom: High ceilings 'cottage bead board style,' two twin beds, private bath (tiled shower), all built-ins, TV, ocean view. Fourth bedroom: Queen with all built-in closets, storage, etc., TV, private adjoining bath with tub and shower, granite vanity, ocean view. The vaulted beamed great room is full of character. There is plenty of comfortable seating with panoramic views of the Gulf. Large LCD TV and surround sound is a plus. The adjacent open kitchen/dining area has a fully equipped kitchen (including large shrimp pots) dishwasher, refrigerator with ice-maker, SEP commercial ice-maker, stove, built in microwave and granite counter tops. Dishes, cookware and utensils are furnished. Round dining table is great for bridge, poker, scrabble, etc. Guests will also enjoy the long additional 'yacht' breakfast bar with stools. Spiral staircase leads to the Cupola with 360degree views of the Gulf with built in custom sofa ( great for relaxing and napping . Laundry room has washer and dryer, utility sink and built-in iron & ironing board. Three multi-level decks with deck furniture distinguish this house and offer both sun and shade. The large main deck with pergola extends across the entire southern front of the house. The second sun deck, with built-in benches, is perfect for morning coffee or an afternoon vino. The third lower covered deck is shaded and great for napping, relaxing or reading in the swing. All decks have open views of the gulf. The spacious hot and cold outdoor shower is convenient and refreshing after a day at the beach. Amenities: Four bedrooms, four baths, hot and cold enclosed outdoor deck shower, direct TV (160 channels), free long-distance, tiled floors throughout, ceiling fans, central heat and air, 5 TV's, 3 DVD's, surround sound, internet, BBQ grill and swing. Activities: The Beach Club, with spa facilities (251-540-2582) offers multiple pools, tennis courts and restaurant within walking distance. You may purchase a guest membership. Restaurant is open to the public. Kiva Dunes Grill is great for casual lunch and breakfast. Bon Secour Wildlife Refuge. Great for hiking. Private, undeveloped shore line. Fishing, Sailing, Boating: Fort Morgan Marina ferry to Daulphin Island. Visit Sea Estuary. Three convenient Fort Morgan golf courses: Kiva Dunes, Pennisula and Gulf Shores Country Club. Access to Cabana Beach bay lot for fishing on the bay. Now accepting reservations. Book early. Foley shopping Outlet located nearby. Golfing at Kiva Dunes, or the Peninsula Golf Clubs is first class. Located less than five miles from either course. Other golf courses in the area are only minutes away.